[By Richard Sheppard in Healdsburg, California] In an effort to learn more about the wine making process, today I'm visiting John Bacigalupi. 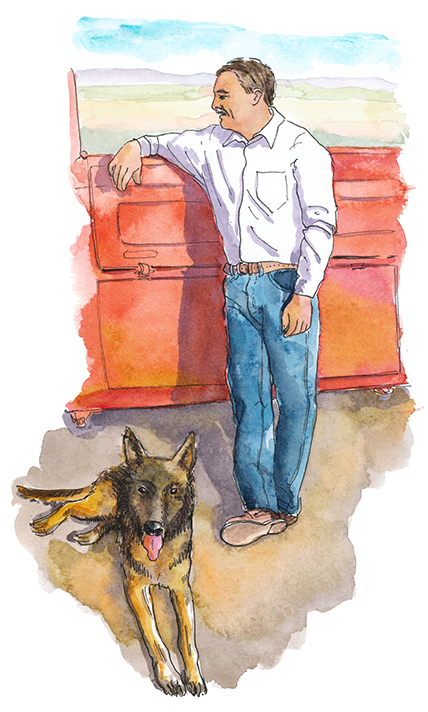 John grew up farming along side his father Charles on their Sonoma County, California ranch. “We pruned the vines about a month ago, and now bud break’s just beginning,” he tells me. “Even though morning temps have been low, frost hasn’t been a problem.” We walk along the rows of old vines sloping downhill from where we are, only to rise and disappear over the next hill. The only thing breaking the view is a single, majestic oak. “We took out some trees awhile ago to expand the vineyards, but we decided to keep that oak as shelter for events. Look at how perfectly round its canopy is. The vineyard to the left of the oak is Pinot Noir. These old vines we’re walking along are the famous Paris Tasting block of Chardonnay.” The head pruned vines are twisted and gnarled with fresh spring grasses growing between rows of black stocky wood. “The vines have had problems over the years and in part by mistakes we made while learning how to care for the vineyard. There wasn’t much covered in books back then. We didn’t know not to prune too early to avoid frost or disease. Same is true for pruning while it’s raining. The disease spores are more likely to spread in wet weather. “Back in 1964 my father created a reservoir to capture water during the rainy season. Still today, the reservoir collects enough water to irrigate all the grapes on our property for the remainder of the year. Up on hills like this one, you see, there’s no water table for vines to tap into. “Our vineyards now consist of 125 acres of premium grapes, which I’ve managed for over 30 years. 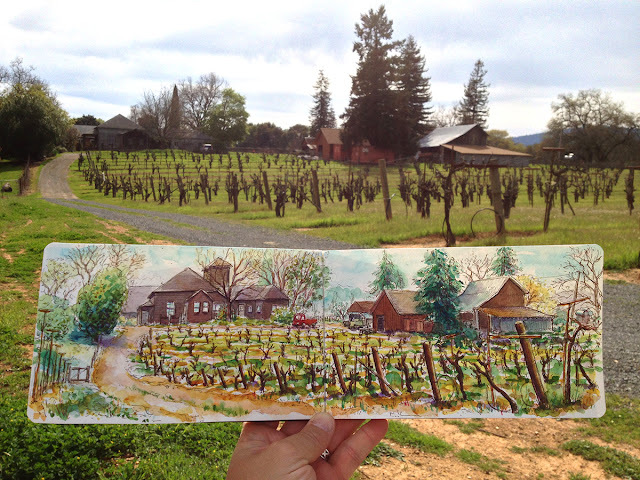 Growing up, some of my fondest memories are of shadowing my father in the vineyards. As a self-taught grower, he learned everything about the vineyards from experience, trial and error. Although he doesn’t formally participate in the harvest any more, he likes to ride the 4-wheeler around the vineyards, and he sometimes even drives the tractor during harvest,” John says. “Because my father used St. George rootstock, phylloxera isn’t a problem. 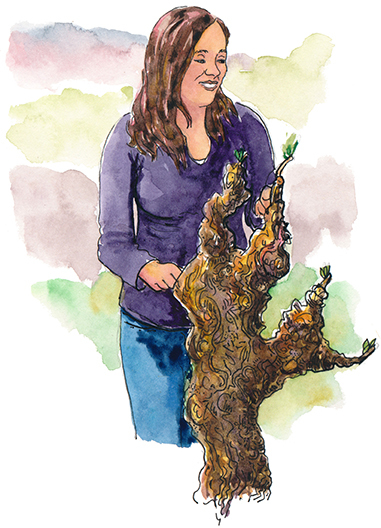 But over the years the vines have contracted a bacteria that infects the pruning cuts and works its way down to the roots, eventually killing the plant.” John points to a dark section of the vine’s trunk where no flaky bark exists. “That part of the vine is dead. But the rest still has some life in it and produces good tasting fruit. John points to a green vine sprout protruding from a nodule. Bud break. Katey and I look in close. Two shoots are growing out of each spur, with morning dew settling on the young leaf’s tips. “See that bunch in there?” John says, pointing to a small bulbous portion of the plant, its surrounding leaves unraveling like a new butterfly. “The entire plant is contained within this little bud. The leaves, cane, and grapes are all there.” One of life’s many miracles. Walking back towards the house, we pass between the West Side Road Neighbors Pinot and the Paris Tasting Chardonnay block. There I find the best view of the property, with the Chardonnay in the foreground and the ranch up the hill behind. I pull my sketching kit out of my bag and begin drawing the view looking back at the old house. The vineyard is intimately quiet, broken only once by the distant sound of a quail’s call “chi-ca-go,” though I never catch a glimpse of it.